Presentationhost.exe appears on several AppLocker whitelist bypass lists (e.g. api0cradl and milkdevil) but I wasn’t able to find any good instructions on how to use it so I decided to figure it out myself. This blog post shares the results of that research by presenting a proof of concept application that will run PowerShell commands using the same c# code I used for my .hta powershell runner. Presentationhost.exe is a built in Windows executable that is used to run XAML Browser Applications (i.e. .xbap files). Opening a .xbap file appears to launch the application inside Internet Explorer but the code is actually run in another process (Presentationhost.exe) usually in a sandbox to protect the user from malicious code. If you are familiar with Java Web Start files (.jnlp) xpabs behave similarly except that Internet Explorer launches Presentationhost.exe instead of Java.exe and they are written in c# instead of Java. Note that xbap’s are able to request different privileged levels. To perform potentially malicious actions, the application has to request unrestricted permissions which can be done when opening an xbap from a file location (i.e. the local file system or a network share). Attempting to open an xbap over HTTP or FTP will fail if the application requests too many permissions. You can read more about the security model here. Downloaded visual studio 2010 professional service pack 1 trial (you can also use the latest visual studio with the ‘.net desktop development’ workload installed but it takes a lot longer to download and setup). 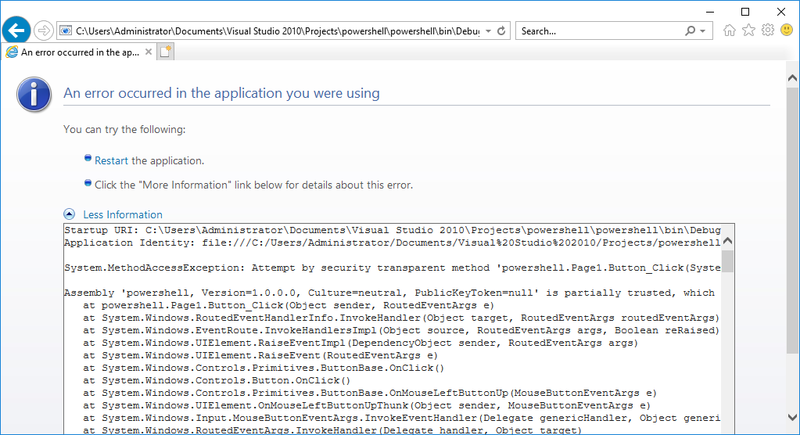 Open visual studio and selected “New, Project”. 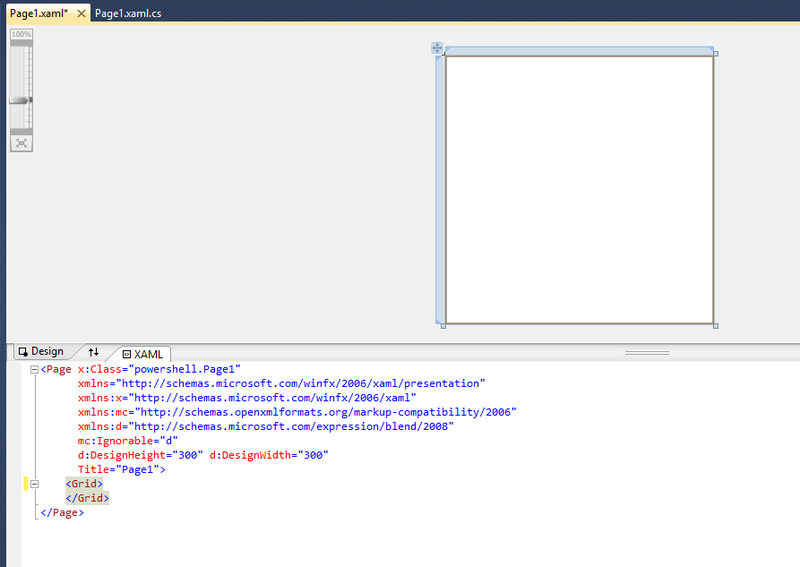 In the new project screen, search for “WPF Browser Application” and created a new Visual C# app. After clicking run a blank page will appear. This is your application congratulations! The next step is to make it do something useful. First lets create a simple UI that lets you enter commands on the left and outputs the results on the right. We will also add a button with a click event. If you try to run the application now you will get an error that there is no definition for “Button_Click”. 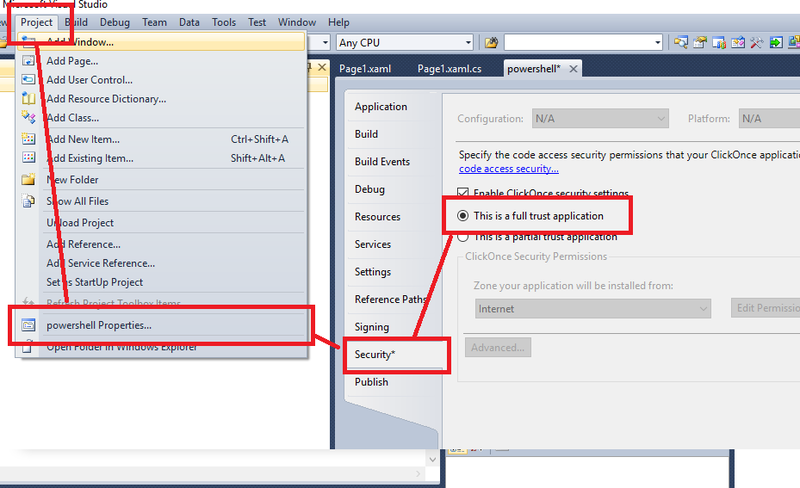 To define the button click method open Page1.xaml.cs. We will use C#’s Pipeline class to run our PowerShell commands (interesting side note, running PowerShell commands this way bypasses constrained language mode). Below is the code that will run some PowerShell commands in a Pipeline and write the output to the screen. This error is the Presentationhost’s sandbox telling you that the application has tried to do something above it’s privilege level, you can read more about xbap security here. To have the xbap request full trust permissions (i.e. non-sand-boxed access to the OS) go Project -> Properties -> Security and select the “This is a full trust application” radio box. 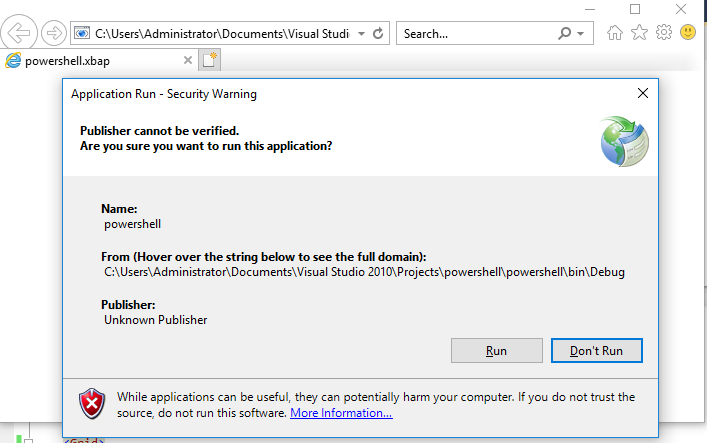 Run the application and should now be able to run PowerShell commands! 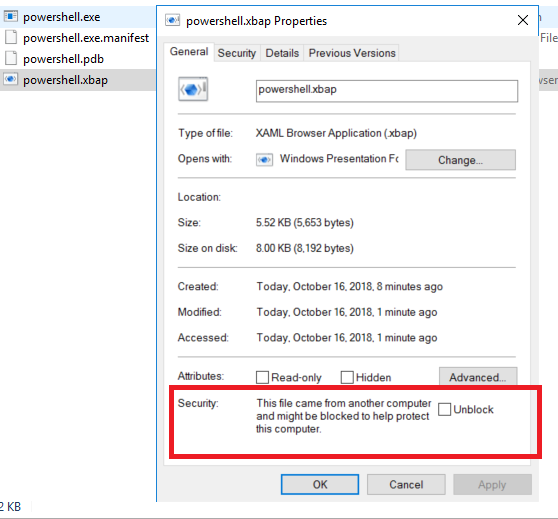 To bypass default AppLocker rules copy these files to the locked down computer and double click the .xbap file. If you downloaded the file from a website it won’t run because it contains the Mark of the Web. To remove the Mark of the Web right click the file and click the “Unblock” checkbox (or you can use PowerShell). If you don’t want to copy the files to the locked down computer, you can run presentation host from the command line using a file:/// URI or UNC path e.g. I’m not sure that there are many occasions where I would use this AppLocker bypass over other whitelist bypass (e.g. my .hta PowerSehll runner). However, as PowerShell logging becomes better (and start to block some of my favourite pentesting tools), the ability to develop and run more complicated C# programs on locked down PCs is interesting. For example, BloodHound’s data collector is now a PowerShell script that loads a pre-compiled C# binary into memory. This feature is blocked when Constrained Language Mode is enabled. It wouldn’t be too difficult to compile SharpHound (the data collector) into an xbap to bypass application whitelisting and PowerShell security altogether. A Powershell Empire xbap agent would be useful too (I have added these two projects to my to-do list).